LOSE WEIGHT OR YOUR VISCERA WILL SUFFER!! Your body will suffer greatly if you don’t lose weight. 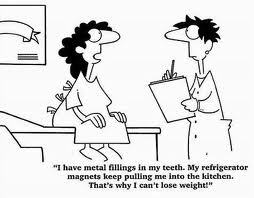 Being even 20 lbs over what you should weight can cause health problems. What are some results of not dropping lbs? Well-Unfortunately there are many diseases related to being overweight. Which one would you like to read about first? This is a Posterior (back) view of a cross-sectioned human body!! The whitish area on the outside of the body is fat. 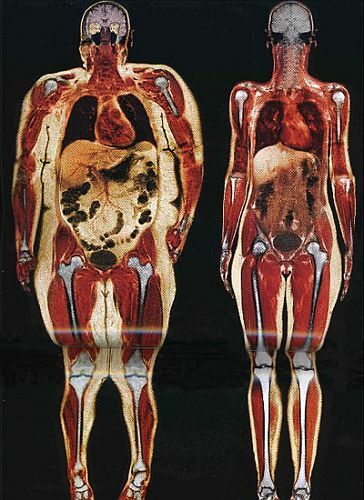 Notice the difference between the viscera (organs) on the thin body compared to the larger one. Look at the adipose tissue (fat) surrounding the heart. If you think the amount of fat covering your heart makes a difference on it's performance you'd be correct! 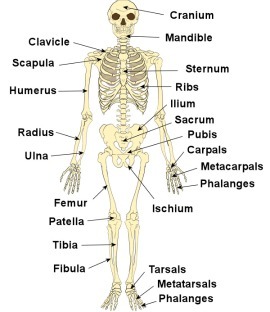 Pay close attention to the thigh and ankle bones. Do you see any disparity between the two? The obese individual's bones are bowing outward. Do you see the compression at the knee joining the femur (thigh)and the tibia (lower leg) bones? The more weight on your body, the more pressure and stress on all organs. And the most devastating problem of all, your body doesn't Heal as FAST from Injury or Disease!! "Lose Weight with YOUR Health in Tact"
Healthy ways to drop pounds can rid you of each one of the maladies listed above. Fat Loss is not difficult, as I have said over and over again. If you expect any healthy diet to work you must continue on with it. Fat pretty much stays where it accumulates and no amount of wishing it away will chase it off your body. Getting the excess off from under the skin is the least important of all fat loss. You know, if there’s excessive fat around the perimeter of your body, it's around all your other organs as well. Keeping within parameters healthy for your body eliminates fat around your heart, kidneys, liver, pancreas. And any other place it accumulates. You’ll also find adipose deposits inside organs such as hundreds of kilometers of blood vessels. You are also playing "Russian Roulette" with blood clots inside the heart and inside the brain when you remain weighed out of control. We discuss the effects of weight gain and the rewards of losing weight. You’ll understand what 10 pounds of fat does to your heart after 4 or 5 years. JUST ABOUT EVERY DISEASE RELATED TO WEIGHT GAIN THAT ORIGINALLY IMPACTED ONLY ADULTS IS NOW EFFECTING YOUNG PEOPLE....TOO!! You might think because you are overweight and in your twenties no harm will come to you. Your organs are so new 15 or 20 lbs of impacted visceral adipose tissue won’t slow you down or injure your body. Heart disease in teens is on the rise correlated to obesity in children. Just take one "little step" towards clean healthy food intake. Say no to two pieces of cake, buy a small bag of potato chip, replace ice cream with sherbet. Please take a minute to read over these pages and learn why getting in shape has great value to you at any age. Where never a tear falls for a victim of diabetes, heart failure, stomach cancer, colon cancer or breast cancer, only mentioning a few maladies. I’m not saying throw away you knife, fork and your spoon, just use them a little less. Don’t suffer but get started today, your family will absolutely thank you for it.